A.J. Turner begins his shooting motion. The junior forward made six three pointers on Saturday. 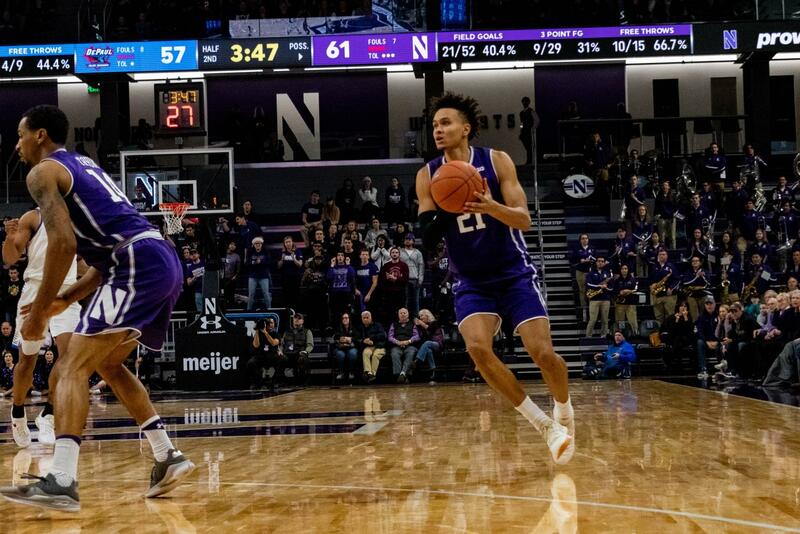 After Northwestern’s abysmal first half Saturday, it looked like the Wildcats would need a fundamental shift in their offense to come back from a 41-29 halftime deficit. In the end, all it took was making more three-point shots . NU hosted local rival DePaul in a crowded Welsh-Ryan Arena, and the Blue Demons (5-2) took control early, shooting 18-for-31 in the first half and stretching the lead to 15 points halfway through the second half. The Cats put up long shots all game and were just 5-25 from beyond the arc with 9:49 left in the second half. Then, down by 15, NU (7-3, 0-2 Big Ten) finally found their stroke and stormed ahead. Junior forward A.J. Turner started the Cats’ 25-0 second half run with a three-pointer, cutting DePaul’s lead to 12. Turner was averaging 9.7 points a game before Saturday and had struggled with his three-point shooting. Today, he broke out with 24 against the Blue Demons and connected on six attempts from beyond the arc. Coach Chris Collins said he’s discussed “the law of averages” with Turner, and wants the transfer from Boston College to keep taking shots and being aggressive. “When you’re a good shooter and you put in time, before long you’re going to start knocking them down,” coach Chris Collins said. That seemed to be the mentality for much of the team on Saturday — just keep shooting. NU kept the ball on the perimeter for most of its offensive possessions. Senior center Dererk Pardon, the only player to regularly get touches in the post, finished with just seven field goal attempts. Guards freshman Ryan Greer and sophomore Anthony Gaines looked to be driving to open up three-point opportunities for their teammates. Most of the Cats’ screens were high, well above the key, and often sucked Pardon from the paint. Senior forward Vic Law, who came into the game shooting 45.7 percent this season from three, could not get one to drop for the entire first half against DePaul. He missed seven before hitting his first three-pointer. Graduate guard Ryan Taylor also let miss after miss fly early, racking up an six misses before he sank his seventh attempt from beyond the arc. In the second half, NU stuck to their ways but found more success. During the 25-0 run, the Cats made all six attempted three-pointers. Turner drilled three, Law canned two and Taylor downed another one. The shooting gave the Cats the lead, momentum and opened up the paint for Law and Pardon. DePaul’s coach Dave Leitao said that NU took shots, built up a lead and kept playing with the intensity they had used to mount the comeback. NU finished with 31 three-point attempts to DePaul’s 22. Against Indiana and Michigan earlier this month, the Cats only put up 17 a game. Turner, who finished 6-for-10 from three, said that NU should keep the same mindset moving forward, despite the early-game struggles.